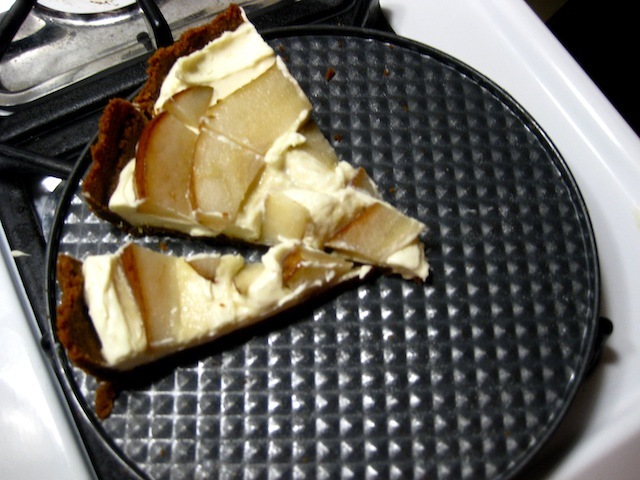 For Better or Worse (a post by Josh): Ginger Tart with Pear & Mascarpone – Eat Me. Drink Me. My grandparents have been married for fifty-one years and two days. That’s more than twice my age. That means that they got married in 1958. They’ve been together since 1949. About a week ago, on their anniversary, they came over to my house to celebrate. When they were over here, they told me stories of how normal weddings took place in the town you grew up in, not some travel vacation. And the reception wasn’t anything too big, sometimes even punch and cookies in the basement of the church (where all weddings took place). Today, it’s kind of funny to think of getting married and asking everyone to just walk down to the basement for some sugar cookies. Maybe it’s just an indication of the times, or one of those competitions things we have here in America (my wedding’s going to be better than yours, see: MTV’s Super Sweet Sixteen). Either way, they came over to my house three days ago and we were going to have a big thing for them. We wanted to make this year special. Why 51 and not 50? Honestly, because I was in Paris last year, eating baguettes, cheese, and duck and running around the Seine. So, this year the whole family was together and we were going to celebrate! We had the whole thing down. The Kaplans would bring a salad. Nancy would cook her famous chicken and dumplings (I’ll try to steal the recipe from her soon enough). And I was delegated to dessert. I think I’ve got a reputation in my family for making dessert. That’s okay with me, I’ll have to say. So my task was to now make something good enough to satisfy the 10 people of my family while also making it special enough for my grandparents’ anniversary. I thought: carrot cake? No, I make that too often. I’d also have to make two (one for Brianna, one for our family). Maybe something like a chocolate cake? Nope, way to boring for this. I wanted it to be better than anything they might have had before. High ambitions, I know, right? I’ve been told in the past to not experiment when company comes over, but this wasn’t company. This was family. So I obviously had to experiment. If it was going to be bad, they’d never say anything. That’s a lie, they’d give me crap for years, but I decided to go for it anyway. Searching around on Epicurious, I wasn’t all that inspired. That’s really a place I go more for recipes to dishes I know I want to make. So instead, I took the advice of a friend who recommended Smitten Kitchen to me. It’s another food blog, that if you haven’t read it before, you most certainly should. I mean, in conjunction with this one, that is. But Smitten Kitchen really did help me out. I found her Nectarine, Mascarpone, and Ginger Tart. 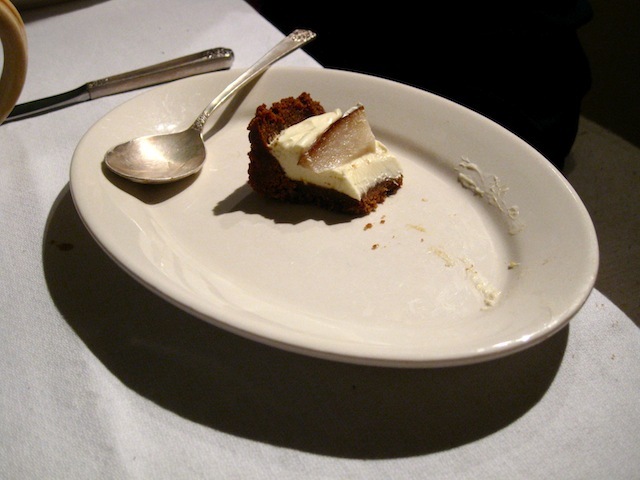 I love mascarpone and ginger, so I decided to read on. The only problem was the nectarines – not because I dislike them, more because they aren’t in season. But we all have our ways of getting around little things like seasonal fruits – there are plenty of fruits that go well with ginger and mascarpone cheese. Pears, I thought, would go well. So off to the grocery store I went in search of pears, mascarpone cheese, and gingersnap cookies. What I discovered was that I’d bought pears that were rock hard. I think I was in a rush at the grocery store, or I forgot I was looking for pears, or I just plain forgot that I needed semi-soft fruit to bake with. Either way, no matter. Back home, I ended up sautéing them with butter, honey, and cloves to soften them and make a glaze at the same time. I think it worked out just fine. The gingersnap crust, after a round with the food processor and cooling it outside in the twenty degree snowy weather, turned out thick, crispy, somehow moist, and just sweet enough to be one of the best crusts I’ve ever had. The filling (a no-bake cheesecake-tart type of mixture) was creamy, semi-sweet with a hint of tang from the mascarpone and Greek-strained yogurt, and just a bit lemony from the zest (which I doubled). I laid the pears out on top of the cooled mixture, drizzled the semi-glaze over the top, and let it cool in the fridge for two hours. What came of the dessert were some of the best compliments I’ve ever gotten, and still am getting. “I mean, I liked your other desserts, but this was on the top of the top, I mean.” I’ve made my family speechless. And my grandparents very happy people on their fifty-first anniversary. “Delicious, that’s all I can say.” Thanks grandma. This is a winter-adapted recipe of Smitten Kitchen’s Nectarine, Mascarpone and Ginger Tart. Serves up to 10, or four very sweet-tooth-hungry people. Preheat oven to 350ºF. Finely grind gingersnaps in food processor, then add butter and blend until crumbs are evenly moistened. Press mixture over bottom and up sides of a 9-inch tart pan (I used a spring-form pan, but that’s because that’s all I had). Bake crust until color darkens, pressing sides with back of spoon. (I did it for about 8 minutes. I had to stop then because the butter started to drip to the bottom of the oven and smoke my house out.) Cool completely (outside in 20-degree weather is always a nice option). To make the filling, beat the first six ingredients in a medium bowl until smooth. Spread filling in prepared crust and cover loosely. Refrigerate at least 2 hours and up to 1 day. To make the topping, sauté sliced pears in butter and cloves on low heat until soft, about 10 minutes. Drizzle honey on top of the sautéing mixture. Take pear slices and overlap in concentric circles on top of the pie filling. Serve, or refrigerate up to 6 hours more. Josh, the dessert was outstanding and I hope to be eating it again next year. Our 51st anniversary will be a special memory always! Now we are looking forward to the next family celebration in May. Sounds delicious! Yes, Smitten Kitchen is a great site (and pears were an inspired substitution). Congratulations to you–and to your grandparents!